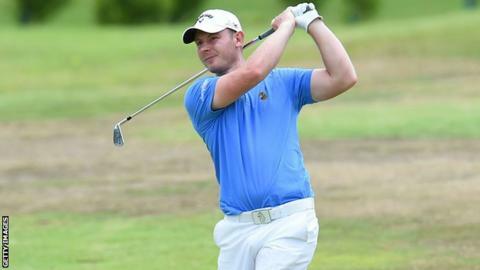 Scotland's Scott Henry finished runner-up at the Madeira Islands Open for the second year running. The 28-year-old from Clydebank shot a final round 66 to finish on 21 under par, three shots behind winner Roope Kakko of Finland. Fellow Scot Andrew McArthur was third on 18 under after matching Kakko's closing 63. Henry missed out in a play-off to Englishman Daniel Brooks at the 2014 event. Henry moved two shots clear at the Clube de Golf do Santo da Serra with birdies at the first three holes on Sunday. But Kakko responded with his own hat-trick of birdies from the fifth to reach the turn one stroke ahead of the field. The Finn went on to chip in at the par four 10th for an eagle and would never look back on the way to his maiden European Tour victory.